The schlocky 1998 Bruce Willis movie Armageddon was the highest grossing film of that year. The blockbuster saw a master oil driller (Willis) and an unlikely crew of misfits place a nuclear bomb inside a giant asteroid heading for Earth, blow it up – and save humanity. Armageddon isn’t exactly a documentary: it’s packed full of sci-fi nonsense. But, 20 years on, its basic plot – of using a nuclear explosion to avert a cataclysmic asteroid collision – doesn’t seem quite as silly as it did at the time. Incoming asteroids have been scarring our home planet for billions of years. This month humankind left our own mark on an asteroid for the first time: Japan’s Hayabusa2 spacecraft dropped a copper projectile at very high speed in an attempt to form a crater on asteroid Ryugu. 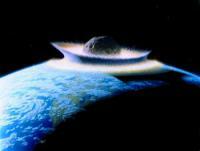 A much bigger asteroid impact is planned for the coming decade, involving an international double-spacecraft mission. A mere 17-20 meters across, the Chelyabinsk meteor caused extensive ground damage and numerous injuries when it exploded on impact with Earth’s atmosphere in February 2013. To prevent another such impact, researchers use a simple yet ingenious way to spot these tiny near-Earth objects (NEOs) as they hurtle toward the planet. Cybersecurity incidents are gaining an increasingly high profile. These attacks are becoming increasingly sophisticated, using psychological manipulation as well as technology. To face these challenges, society needs cybersecurity professionals who can protect systems and mitigate damage. There is already an active population with a strong passion for cybersecurity – hackers. From astronauts and submariners to miners and rescue workers, people who operate in small, enclosed spaces need good air quality to work safely and effectively. Newly developed electronic sensors can simultaneously detect at least three critical parameters that are important to monitor to ensure human comfort and safety. A new space weather model reliably predicts space storms of high-energy particles that are harmful to many satellites and spacecraft orbiting in the Earth’s outer radiation belt. The model can accurately give a one-day warning prior to a space storm of ultra-high-speed electrons, often referred to as “killer” electrons because of the damage they can do to spacecraft such as navigation, communications, and weather monitoring satellites. Researchers and colleagues have designed a new device that creates electricity from falling snow. The first of its kind, this device is inexpensive, small, thin and flexible like a sheet of plastic. The first shipment in five years of Transuranic (TRU) waste from the Los Alamos National Laboratory has been successfully delivered to the Waste Isolation Pilot Plant (WIPP) near Carlsbad, New Mexico. Around the world, water reallocation from rural to urban regions—the practice of transferring water from rural areas to cities to meet demand from growing urban populations – is intensifying. Researchers found that 69 cities with a population of 383 million people receive approximately 16 billion cubic meters of reallocated water per year—almost the annual flow of the Colorado River. Flooding is the natural hazard with the greatest economic and social impact on the population of the United States. Urban flooding is a complex and distinct kind of flooding, compounded by land use and high population density, and it requires a different approach to assess and manage. Many coastal homes have significant structural vulnerabilities that leave homeowners and their homes largely unprotected from storms. Additionally, the majority of coastal homeowners have little to no intention of reducing these structural vulnerabilities, even though they live in areas frequently affected by damaging hurricanes and flooding. Volcanologists have discovered the driving force behind superheated gas-and-ash clouds from volcanic eruptions, which may help save lives and infrastructure around the globe. Endangering 500 million people worldwide, pyroclastic density currents (or pyroclastic flows) are the most common and lethal volcanic threat, causing 50 percent of fatalities caused by volcanic activity. A new, free, open-source software reliably predicts how damage from hurricanes, ice storms, earthquakes, and other extreme events will restrict power delivery from utility grids. The Severe Contingency Solver for Electric Power Transmission is the only software available—commercially or open-source—that reliably supports analysis of extreme events that cause widespread damage. Traditionally, Maurepas Swamp serves as a natural barrier against flooding that threatens New Orleans each year. Native flora soaks up the rainfall, spreading it across a network of cypress roots and cattail. But centuries of logging and canal construction have drastically altered the swamp’s ecological composition. The Mississippi levee system compounded the issue, isolating the swamp from vital sources of fresh water and nutrients. Flooded with saltwater, much of the existing cypress withered and died. Young trees, now, are few and scattered. Melting ice sheets in Greenland and the Antarctic as well as ice melt from glaciers all over the world are causing sea levels to rise. Glaciers alone lost more than 9,000 billion tons of ice since 1961, raising water levels by 27 millimeters. Every year earthquakes worldwide claim hundreds or even thousands of lives. Forewarning allows people to head for safety and a matter of seconds could spell the difference between life and death. Researchers demonstrate a new earthquake detection method — their technique exploits subtle telltale gravitational signals traveling ahead of the tremors. Future research could boost early warning systems. California hospitals would need to make substantial investments—between $34 billion and $143 billion statewide—to meet 2030 state seismic safety standards, according to a new report. There is mounting evidence of the risks posed by water scarcity to business and economic growth. A 2012 projection by the International Food Policy Research Institute says 45 percent of total GDP — $63 trillion — will be at risk due to water stress by 2050. With coordinated action, better water provision in Africa will strengthen economic growth and unlock the path to prosperity for millions, according to SABMiller’s Chief Executive Alan Clark. Many nations and regions already facing uncertain political futures must contend with a growing threat to stabilization: freshwater vulnerability. An analysis of 119 low-income countries finds common challenges that could inform broad solutions. European researchers have found substantially different climate change impacts for a global warming of 1.5°C and 2°C by 2100, the two temperature limits included in the Paris climate agreement. The additional 0.5°C would mean a 10-cm-higher global sea-level rise by 2100, longer heat waves, and would result in virtually all tropical coral reefs being at risk.